Fake Blood’s Blood Music label return to Room One in fabric to mark the release of his forthcoming three-track ‘Yes/No EP’ on Different Recordings. 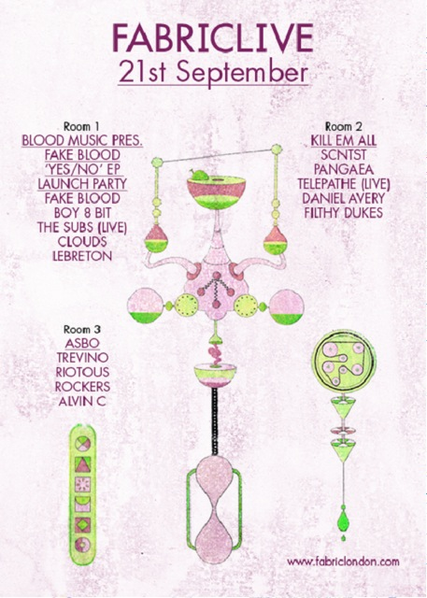 Building the momentum around a live performance from Belgian label signings The Subs, whose EP ‘Hypsteria’ is out soon, their lineup reflects Fake Blood’s ethos perfectly with sets from similarly energetic DJs like Boy 8 Bit, Clouds and Lebreton. Boyz Noize signed artists SCNTST has been tipped by a smattering of influential DJs and he’s earned himself a headline spot at Kill Em All in Room Two as a result. Brooklyn duo Telepathe will return to London for an expectant live show alongside one third of the trio behind Hessle Audio, Pangaea, who’ll be serving up one of his tough DJ sets alongside FABRICLIVE 66 artist Daniel Avery and the Filthy Dukes. The team behind the ASBO club night, Alvin C and the Riotous Rockers, return to Room 3 inviting Marcus Intalex to perform under his more supple techno guise of Trevino.